Fold the bag from the top, down 4 and 1/2 inches. Pencil in cutting lines to round the resulting flap. Cut, being sure to trim off the jagged edge. 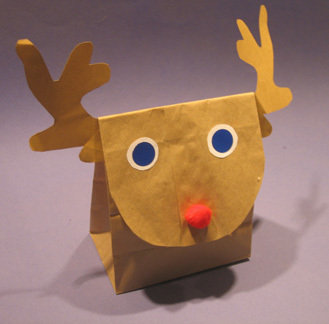 Using another paper bag and our template, cut out the combination ears and antlers. Glue them under the flap. Cut out 2 small rounds from white paper. We used the lid of the bigger glue stick as a template. Glue them on Rudolph's face. We used the sticky dots found in stationery stores for his blue eyes, but you could just as easily cut your own from colored paper using the lid of a smaller glue stick as a template. Now add that pom-pom (found at craft stores) for his nose.